This altarpiece was painted for the monastery of Santo Domenico in Fiesole, near Florence. The central panel shows the Archangel Gabriel’s Annunciation to Mary under a portico. On the left, Adam and Eve are being expelled from Paradise. The damnation and salvation of Humanity. The predella has scenes from the life of the Virgin; Mary’s Birth, Her Wedding with Saint Joseph, Mary’s Visit to her cousin Saint Elisabeth, the Birth of the Christ Child, the Presentation of Jesus in the Temple and the Dormition of the Virgin with Christ receiving her soul. 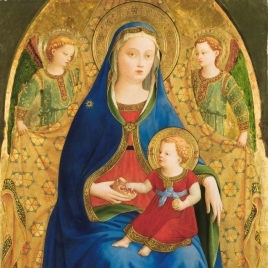 Fra Angelico, also known as Blessed Angelico, dedicated his work exclusively to religious subjects as he understood art to be an aspect of religious devotion. He was particularly meticulous in the details and qualities of Nature and of the objects and persons depicted. 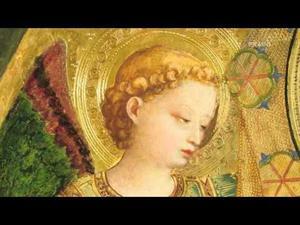 In his style, Fra Angelico merged the late Gothic Italian style with the new language of the Renaissance. An example of this is the architecture’s spatial depth, which, while in keeping with Brunelleschi’s recommendation to occupy the center of a square and unadorned stage, nevertheless shows some of the errors present in Angelico’s early works. 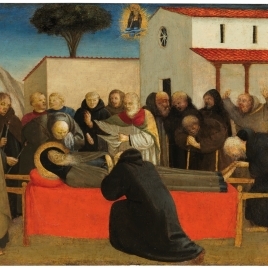 The Virgin of the Pomegranate" and "The Funeral of Saint Anthony Abbot" by Fra Angelico. Height: 190.3 cm. ; Width: 191.5 cm. Convento de Santo Domingo, Fiesole, 1425/28-1611; duque de Lerma, para la iglesia de los Dominicos, Valladolid; pasó al monasterio de las Descalzas Reales, Madrid; desde donde ingresó en el Museo, 1861. En el primer panel inferior, donde aparece la escena los desposorios de la Virgen, detrás del público hay un trompetero. Se describe una trompeta natural y recta tipo añafil, que se toca levantada hacia arriba por encima de la multitud. Representaría los toques de señales festivos o llamadas (Proyecto Iconografía Musical, UCM).